Ummm, I’ll consider that a good thing! It looks like we know what direction her room will be going this 2014! Exclusive Plum comes alive when paired with soft gray fabrics, weathered leather, and rich metallic accents in either copper or gold like this Golden Bamboo 2-Tier Foldable Mirror Nesting Table or a Sunburst Antiqued Gold Wall Mirror . Note how in the den in the pic above, used Relic Bronze as an accent color on that gorgeous, espresso stained coffered ceiling. The hue lends a regal richness and warmth to the room. Exclusive Plum can also be the understate neutral in a modern and eclectic color palette of vibrant lime, fuchsia, coral, and persimmon. It is stunning as the single color statement in a room when combined with creamy white and graphic black. Or it can ground a room of soft, burlap neutrals and creams as a main accent wall, full of rich color. 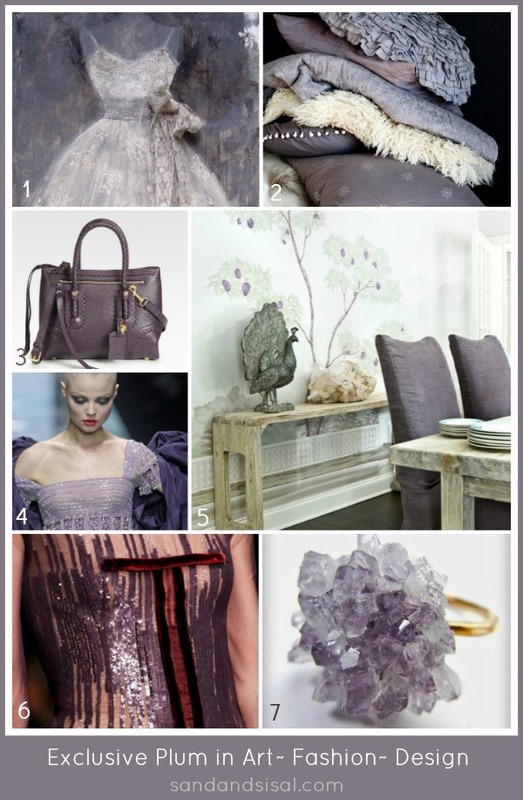 Here’s a look at how the palette of Exclusive Plum is used in fashion, art, and home decor. As you can see, this sophisticated violet pairs well with a variety of styles, creating multiple color schemes which can work in any room. 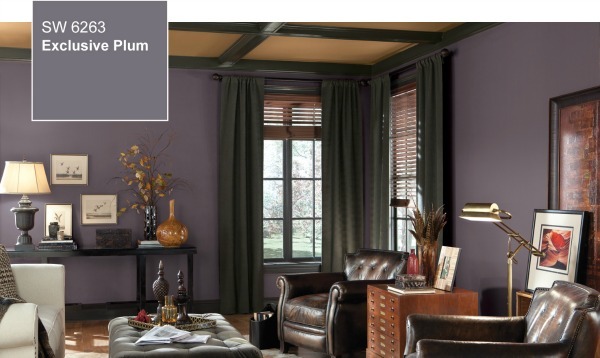 Sherwin-Williams has also released their Color Forecast for 2014, comprised of 38 new colors. These colors are grouped into 4 color palettes named: Reasoned, Diaphanous, Intrinsic, and Curiosity. Exclusive Plum is part of Curiosity. I am such a fan of Sherwin-Williams paint and look forward to trying out a few of these colors in my home! 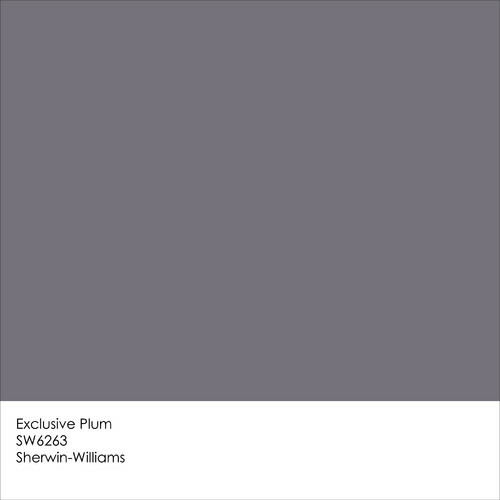 You can see the colors for yourself and play with the color visualizer with this link here: http://www.sherwin-williams.com/color . So what do you think about the new color? I’d love to hear your thoughts? hmmm….not sure I will be switching plum gears. I actually did my master bedroom in my last house a plum color. I will have to share that someday. Perhaps I am the color setter. Have a great weekend. Oh Kelly! I just hopped over to read your post. It’s so pretty! I love the change! 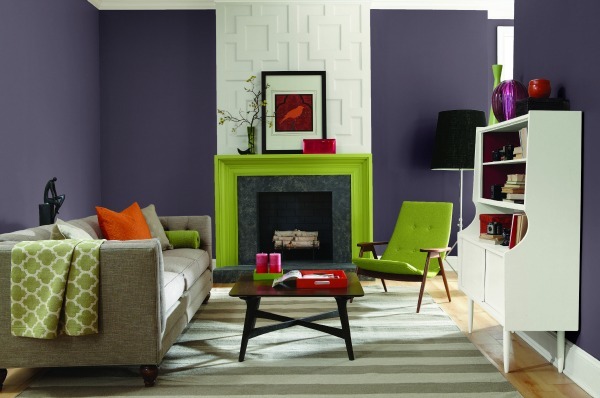 Love the color of the year… hope I can figure out how to incorporate it into our home this year!